Avatar Adi Da's in-depth examination of the devotional and Spiritual traditions of humankind (particularly as seen in Christianity and Hinduism) and the Transcendental Spiritual Reality-Way of Adidam. To read The Pneumaton is to enter a vast and multi-faceted field of paradigm-change and Truth-Revelation. The Pneumaton, like all the books of His Divine Presence Avatar Adi Da Samraj, is an unparalleled Gift—written, as He has said, for the sake of “all who would find heart-breaking Freedom”. 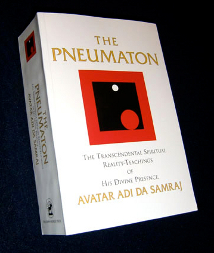 Although The Pneumaton deals with a defined set of topics, the ultimate purpose of the book is not to offer information or argumentation but to draw the reader beyond the usual human ways of thinking and being—into what Avatar Adi Da calls “the Reality-Truth”. It is the purpose of this Revelation-Text to Illustrate a right understanding of the esoteric seeking-traditions and seeking-cultures of Spirituality (including “original” Christianity)—and, that having been done, to then Illuminate the Unique and Always Priorly Searchless “Radical” (or Always “At-the-Root”) Reality-Way of Adidam, Which is the Reality-Way of Perfectly Non-Dualistic Transcendental Spiritual, Intrinsically egoless, and Self-Evidently Divine Self-Realization. —Jeffrey J. Kripal, J. Newton Rayzor Professor of Religious Studies and Chair of the Department of Religious Studies at Rice University, Houston, Texas.